Createx Illustration Mediums are optimized for use with Createx Illustration Colors. 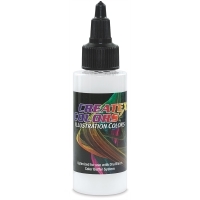 Illustration Transparent Base — This binder-based reducer with solvent can be added to Createx Illustration Colors (or other Createx colors) to improve flow, promote atomization, and prevent tip dry. It's especially useful with smaller tips at lower PSI settings. Reduce as needed, in any ratio desired. 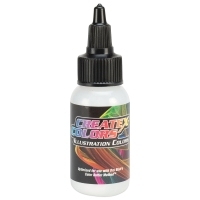 Flexible Adhesion Promoter — This colorless, waterbased primer is very tacky, which allows Createx Illustration Colors (as well as other waterbased colors) to adhere to flexible, slick surfaces such as latex without chipping or cracking. Simply apply the Flexible Adhesion Promoter directly to the surface. It may also be mixed with colors for direct application to surfaces. ® Createx Colors is a registered trademark.™ Illustration Colors is a trademark.